Paris, France – Parisians are grappling with the aftermath of a night of anguish, when a fire tore through Notre Dame Cathedral, gutting its roof and toppling its iconic spire as thousands watched on in dismay from the streets. This morning crowds thronged the banks of the Seine to witness the damage for themselves after hundreds of firefighters battled the inferno through the early hours of Tuesday. 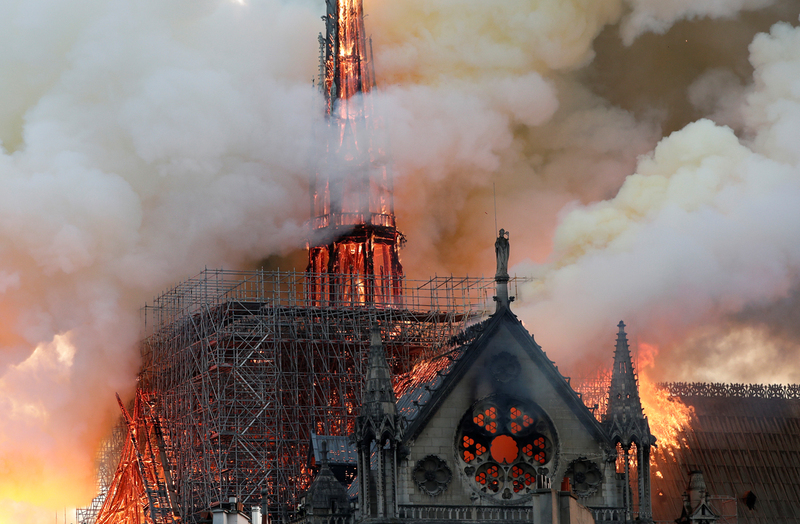 Locals were relieved the damage was not as extensive as they had feared when flames engulfed the medieval masterpiece on Monday evening, billowing smoke across the skyline of the French capital. Just before midnight firefighters announced that the bulk of the structure had been preserved, including its stone face and distinctive bell towers, though the ribbed oak roof had been reduced to ash. “We consider the two towers of Notre Dame to have been saved,” said Jean-Claude Galler, chief of the Paris fire service. A full investigation has been launched into the cause of the fire, which prosecutors say was an accident. Authorities are examining whether it began on the roof, which construction workers were renovating. Engineers will conduct a full assessment of the damage and the integrity of the surviving structure. “The worst has been avoided,” said French President Emmanuel Macron, who rushed to the scene, pledging to restore the 850-year-old cathedral he said was integral to the country’s heritage and identity. “We will rebuild this cathedral together and it is undoubtedly part of the French destiny and the project we will have for the years ahead,” he said. The Foundation for French Heritage has launched a national collection to raise funds for the restoration, while two of the country’s wealthiest men, billionaires Bernard Arnault and Francois Pinault, pledged 300 million euros ($340m) from their fortunes. 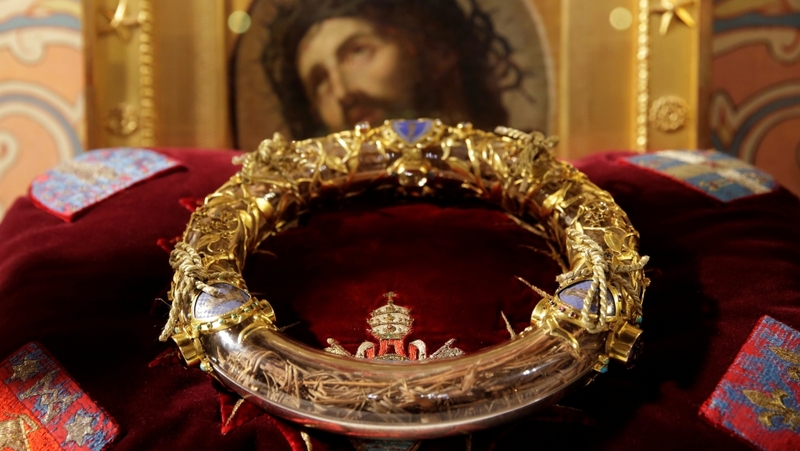 Most of the priceless relics and treasures inside, which included the purported crown of thorns worn by Jesus Christ and its 8,000 pipe organ, were also spared from destruction. One of its celebrated rose windows, whose ornate stained-glass designs date to the 13th century, has been confirmed as saved, though there are conflicting reports about the fate of those on the south and west sides of the building. Churches across the country rang their bells in mourning and solidarity last night, signalling a profound loss that transcends France‘s strict division between religious and secular life. Notre Dame has survived centuries of war, plague and revolution, surveying Paris from its island perch on the river Seine as it grew from a provincial city to the capital of European culture and politics. It was the scene of Napoleon’s coronation as emperor, the inspiration for Victor Hugo’s classic novel The Hunchback of Notre Dame, and today draws 12 million tourists each year, almost twice the number compared with the Eiffel Tower. “Notre Dame is burning, France is crying and the whole world, too, is extremely emotional,” the Archbishop of Paris Michel Aupetit told reporters last night. Parisian Thierry Nico was relieved to see the familiar facade of Notre Dame greet him when he arrived this morning. “We know that probably she will be like before yesterday in 10 years, 15 years, maybe five years, but anyway the structure seems quite solid. I’m emotional but happy,” he told Al Jazeera. On Monday evening at 16:50 GMT the fire broke out in the attic of the cathedral. The blaze consumed the roof and the eight-centuries-old cathedral’s spire before firefighters brought it under control, saving its bell towers and outer walls. The destroyed roof was one of the oldest such structures in Paris. About 500 fighters battled the blaze. One firefighter was seriously injured – the only reported casualty. Paris fire service chief, Jean-Claude Gallet, said the structure, including its two front towers, was saved “and preserved as a whole”. The Fondation du Patrimoine, a heritage organisation, will launch a “national collection” for the reconstruction of Notre Dame, Anne Le Breton, deputy mayor of the French capital’s 4th arrondissement, said. President Macron said a “national undertaking” would be launched, and that “far beyond our borders, we will appeal to the greatest talents … who will contribute, and we will rebuild”. French billionaire businessman Bernard Arnault’s family and his LVMH luxury goods group will donate 200 million euros ($226m) to help repair Paris’ Notre Dame Cathedral. UN Secretary Antonio Guterres said that he was “horrified” by the images coming out of Paris. Former US President Barack Obama said that Notre Dame was one of the world’s great treasures.